Glisten in gold with this choker by Amber Sceats. 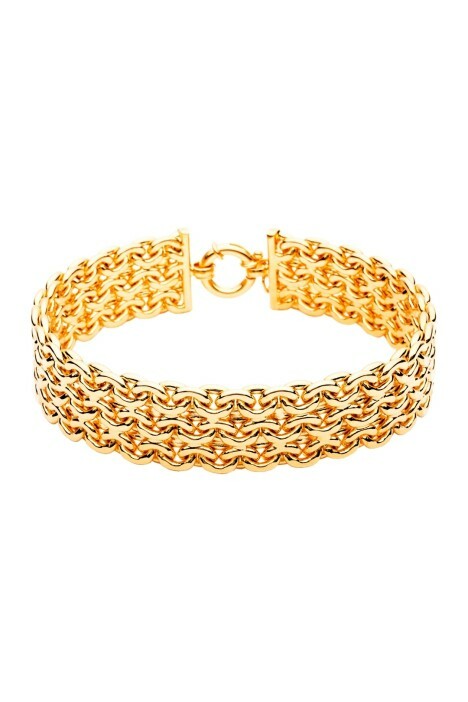 Plated in 24K gold, it features stacked chains for a classic statement look. Enclosed with an adjustable clasp at 2cm wide adds another sleek detail to the overall accessory. Perfectly pair this piece with a casual chic jumpsuit or off the shoulder midi dress for an effortless vibe when you rent it for an upcoming cocktail party or black tie event! Pair with complementary gold jewellery for a polished look. Hire with a little black dress to add a metallic pop or a pink floral for extra warmth. Keep your makeup fierce with a bold red lip, soft eyes and volumised curls. Read our blog post for more celebrity inspired style tips.